a straitjacket, an electric chair, or with a noose around his neck – to the delight of his fans. a campaign to ban him from performing in Britain. Ever the showman, Cooper sent her flowers to thank her for the publicity. it’s just an act. “The juxtaposition is that I am the nicest guy in the world, playing the worst guy in the world,” he says. Today, he’s about as far from the debauchery of rock and roll as it’s possible to get. Smaller in person than he looks on screen – 5ft 9in, and skinny as a rake – he is also softly spoken, polite and mild-mannered, with perfect Hollywood teeth. We’re in Kentucky, and Cooper’s tour bus is parked outside a grotty hotel, close to where he will perform at a state fair. Farmers from across the region have gathered to show off their cows, pigs, chickens and pigeons, and there’s a display of hand-sewn patchwork quilts. As Cooper strides across the hotel lobby, he is accosted by fans who want to shake his hand. Brian, one of Cooper’s handlers, barks orders: “Move it along, folks, move it along!” Cooper seems happy signing autographs, but Brian’s having none of it. been together ever since. He hasn’t once cheated on her, he says. They have three children; their eldest daughter, Calico, performs in his shows. She has appeared dressed as Britney Spears (Cooper “decapitates” her) and Paris Hilton, who gets her throat torn out by a Chihuahua. Boys, with their happy, three-minute songs. in a trailer park. Cooper’s first foray into rock was with a band he formed at school called the Earwigs, then the Spiders. They played cover songs by the Beatles, Rolling Stones and the Who at school dances and local bars. By the time Frank Zappa signed them and they released their first album, Pretties For You, in 1969, the whole band was known as Alice Cooper. It was a deliberately gentle- sounding name designed to send ripples through the crowd, who might have expected a female folk singer to step on stage. Their reputation for shocking behaviour was sealed at a concert that year, when someone threw a live chicken on stage and Cooper picked it up and threw it in the air, thinking it would fly off. However, it plunged into the audience and was promptly torn to pieces. In the hands of America’s tabloid editors, Cooper became the rocker who killed a chicken on stage and drank its blood. “The press blew the incident way out of proportion,” he says. the mentally disturbed, he began to recover. 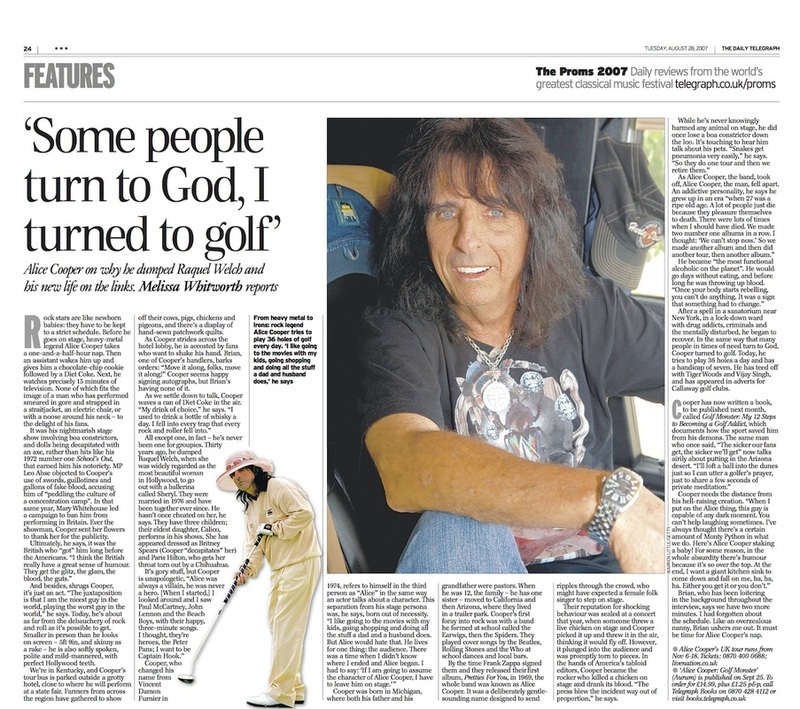 In the same way that many people in times of need turn to God, Cooper turned to golf. Today, he tries to play 36 holes a day and has a handicap of seven. He has teed off with Tiger Woods and Vijay Singh, and has appeared in adverts for Callaway golf clubs. the schedule. Like an overzealous nanny, Brian ushers me out. It must be time for Alice Cooper’s nap.